Once you have set up your profile using the First Time Log In Instructions, go to the Data Access Request Management System (DARM) by clicking on “Access DARM”. On the main DARM dashboard you will see four sections: “All DARs”, “For SO Review”, “Ongoing DARs”, and “Completed DARs”. All of the applications queued for your review can be filtered by selecting “For SO Review”. Click on an application to review. Once an application is highlighted, on the left toolbar you will see the option to review. Click on “Certify or Reject” under the Signing Official section. Once you select this, you will have the option to either certify and submit or reject the application. Once you have made your selection, click submit. 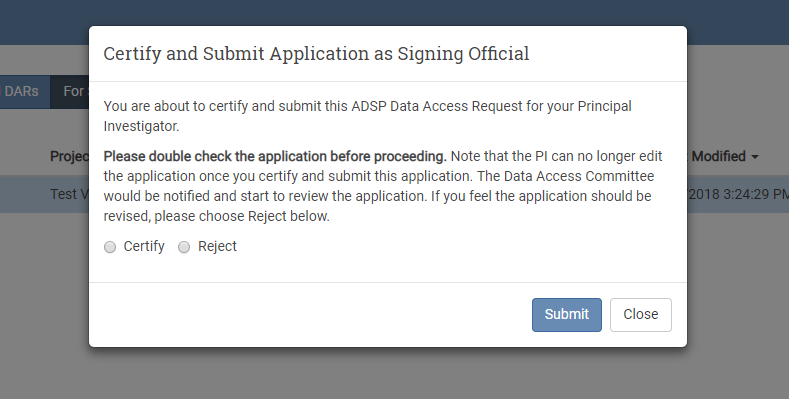 Please note that if you reject the application, you are responsible for communicating any changes that need to be made with the Principal Investigator in order for them to re-submit their DAR for your review. You can view applications once they are approved by the NIAGADS ADRD Data Access Committee (NADAC) under the “Completed Applications” section of the dashboard.